Health is the cornerstone of life and society. Sick students don’t learn and sick parents can’t work, putting their future at risk. So, we work with communities to meet basic health needs to keep families strong. We help run mobile medical clinics focused on screening for common lifestyle health problems, provide basic essential medicines and educate villagers on preventive medicine and healthy habits. 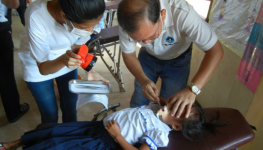 SMF medical check-ups are run by certified Cambodian and Ex-patriot doctors.